The Urim and Thummin were some kind of divination device. They may have been stones or sticks that were placed in a special pocket that was sewn into the breastplate of the High Priest, near his heart. They were clearly used for divination or cleromancy. Urim is translated into English as “lights” and Thummin means “perfections.” Later Greek translations of the Old Testament chose to use the words “revelation” and “truth,” in keeping with their purpose rather than their appearance. The breastplate itself is an emblem of compete truth. With this symbol decoded, The Chariot is a card of great power that shows a victorious hero in a chariot throne. With the help of the Divine Presence, he has discerned a clear path forward. It’s time to take the reins and seize the day! This card speaks of triumph, success, control, mastery, overcoming obstacles and journeys to be taken. The black and white Egyptian androsphinxes on the card reinforce this theme as symbols of abundance, power, wisdom, mysteries and truth. He also has a staff/spear in his hand which corresponds to the suit of Wands. This also speaks of spiritual knowledge, enlightenment and divination. The DruidCraft version of The Chariot simplifies the symbolism quite a bit, with horses replacing the white and black androsphinxes, and a wheel of the year replacing the ancient Jewish symbols. The card still speaks of the same themes as the Rider Waite version. When The Chariot appears in a reading it is telling us we have the skills and wisdom required to master a difficult circumstance and/or be able to discern the correct path forward. 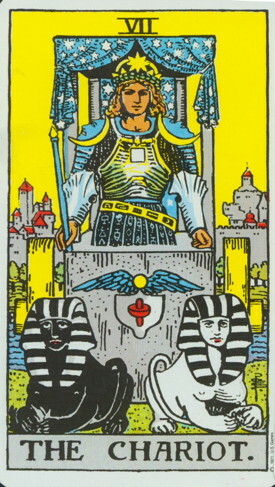 The Chariot tells us it’s time to move forward in a way that is strong and decisive. The wisdom of the Divine Presence is with us so we have nothing to fear. This entry was posted in Tarot and tagged Christian, Pagan, Tarot, The Chariot, Wicca. Bookmark the permalink. I read your link and that’s an amazing analysis of this card. You make a good point in your commentary on my blog. I will rewrite this sentence so that it’s clearer. 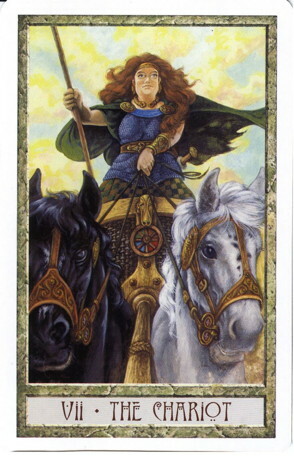 The way this card speaks to me (and we all interpret them a bit differently) is that the chariot represents someone who has the “green light” from the Divine. He/she has discerned the right direction to go, even if it may be a bumpy ride! I would agree with you that no one has complete control of their destiny, but this card tells me to take the reins and seize the day! Blessings to you!